Thursday dawned and we had to get out of bed early for a 9 AM appointment with WBUR-FM's Mike LeClair at the "FM-128" transmitter site, 1165 Chestnut St. in Newton. This tower was originally built for the original WHDH-TV (5 Boston) in 1957; WHDH-FM (94.5 Boston) also used the tower. When WHDH-TV lost its license in 1972, its ownership at the Boston Herald-Traveler refused to sell or lease it to the new licensee, and 94.5 was left alone on the tower. 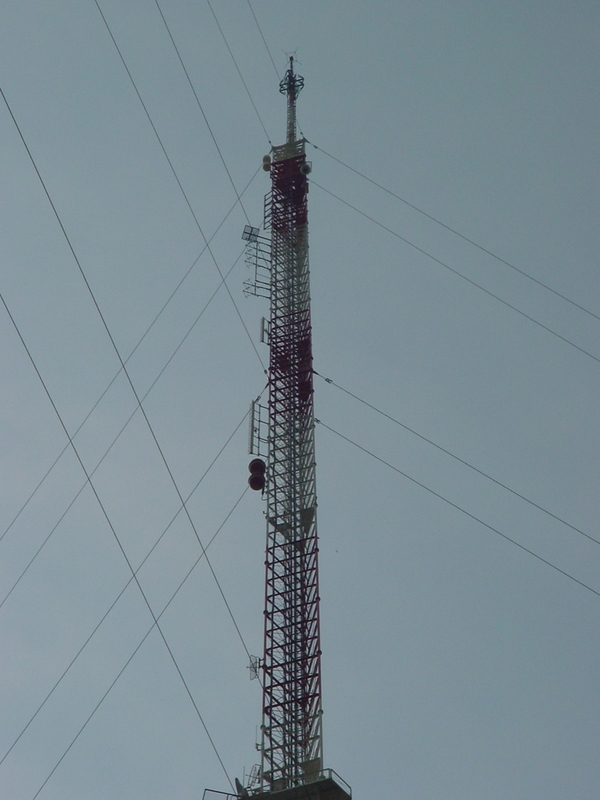 Soon, however, the channel 5 antenna was removed and replaced with a master FM antenna, as other area FMs moved to the site: WBUR (90.9), WBOS-FM (92.9), WJIB (96.9), WROR (98.5), WEEI-FM (103.3), and WVBF (105.7) all joined WCOZ (94.5) on the tower. In recent years, after consolidation, the lineup of stations has changed somewhat: the Greater Media stations, WTKK (96.9) and WROR-FM (105.7), no longer use this site as their primary facility, preferring Boston's Prudential Tower instead—but Greater has expanded its presence at the site by building new auxiliary facilities for WMJX (106.7). WJMN (94.5) is no longer using a separate antenna, joining the other stations on the master. WCRB (102.5) moved from the Viacom tower in Needham when construction there resulted in its eviction. And finally, television returned to the tower in the mid-1990s, with the addition of LPTV, culminating in WVXN-CA (24 Boston) and WBPX's (68 Boston) digital facility on channel 32. The WHDH stations went through a number of owners, and were eventually split up in the late 1980s, and sold on several times in the 1990s through the period of consolidation. Somewhere in all of that, American Tower ended up owning the property, and they continue to manage it today. Copyright 2005, Garrett Wollman. All rights reserved. Photograph taken 2005-06-09.